We were just interviewed by Pinterest co-founder Ben Silberman! If you haven't discovered Pinterest yet, you're missing out. 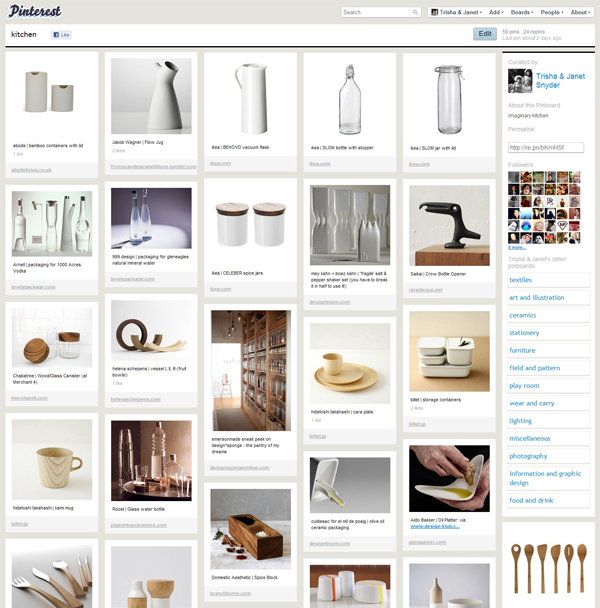 It's a wonderfully addicting new bookmarking site that's sort of a cross between tumblr and ffffound! with automatically linked sources and pin boards that allow you to organize by category. It's fantastic for saving products, interior design ideas, wedding inspiration, tutorials, recipes, places you want to visit, books you want to read, artists you admire, or anything else you can think of, and it's equally great for discovering new things. You can follow people or boards that you like and search popular boards by category. Your boards can even have multiple contributors now. New features are continuously being added and suggestions are very welcome. They are really listening!! Check out some of our boards and read our Pinterview! The pinterview was so much fun. Thanks for doing it. I'm really enjoying your pinboards - let me know if you ever need more invitations for your readers! Ben (at) Pinterest (dot) com.